Never Again Fear the Dark Thanks to LuxoLite All-Round, Multi Color Headlamps! Whether you need to brighten up your path while you are out after dark, to keep yourself safe in an emergency situation, to do household or repair work in a poorly lit room or just to illuminate an hour of bedside reading...LOOK NO FURTHER than this reliable, Best-In-Class Head Flashlight with Red Light! 2. HI SUPER BRIGHT spotlight pierces the darkness at 168 lumens for The Distance of a Football Field! 6. Either have the lamp shining upright or swivel beam angle down towards the ground! 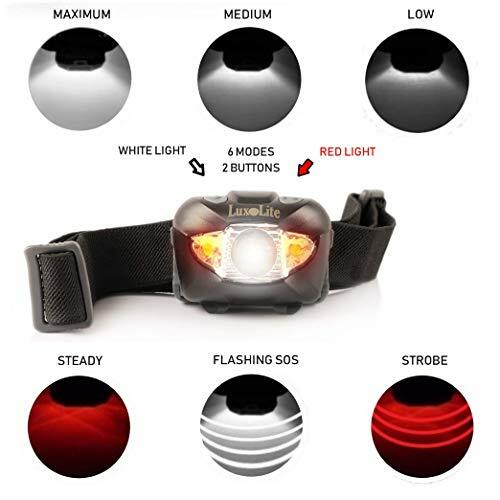 This is the one headlamp you will need for any situation: running, jogging, hiking, backpacking, camping, caving, hunting, fishing, reading, just name it! Great and Unique LED gifts! ACT NOW to get your LuxoLite Head lamp rushed straight to your door! 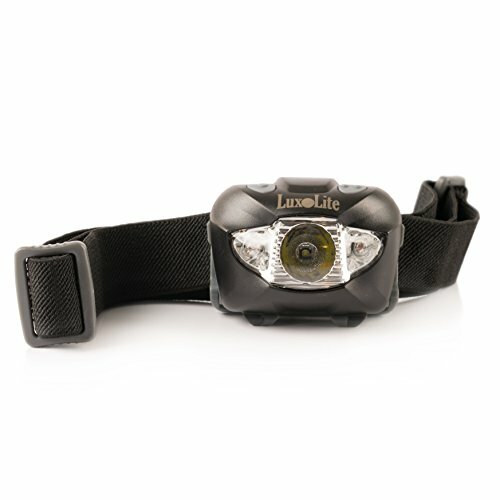 Click the yellow "ADD TO CART" button above to get your own LuxoLite Headlamp and avoid missing out. WHEN THEY ARE GONE, THEY ARE GONE! Copyright © LuxoLite 2017. Sold Exclusively By LuxoLite. 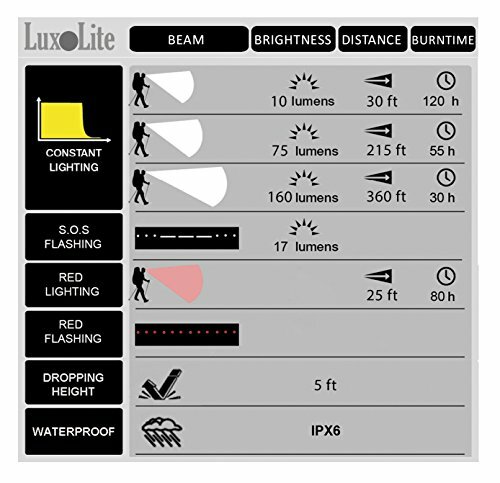 Products sold by the LuxoLite brand are original, as described and no other sellers are authorized selling our headlamps. Shipments are US based.
? 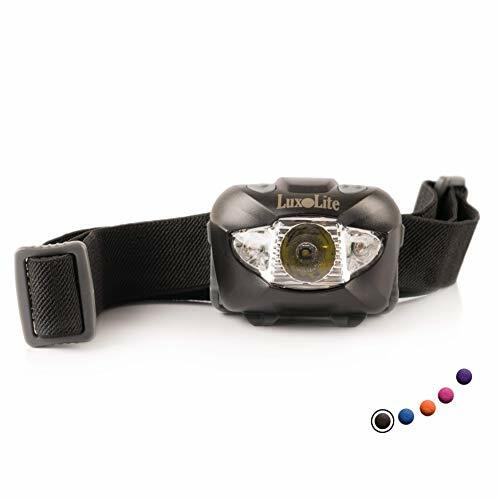 BOOST YOUR VISIBILITY : Strongest & Brightest headlamp to enjoy outdoor sports, run or dog walk while having both hands free. Stop the frustration of juggling around a tactical lantern or portable torch while trying to hold or fix something. Safely perform any task and get more done with this worry-free head mounted flashlight. ? EASY TO USE : 2 separate push buttons to select white or red light. Instantly set the exact brightness you want, no cycling through the modes to turn off. Long lasting battery life by selecting the setting that you need : 4 cool white modes (HI, MED, LO and SOS flashing) + 2 red night vision modes (steady and strobe). ? LIGHTWEIGHT : Only 3 oz. No brainsqueeze or bobbing. Elastic headband adjusts easily and comfortably to any size. Head mount tilts down to focus light exactly where you need it. 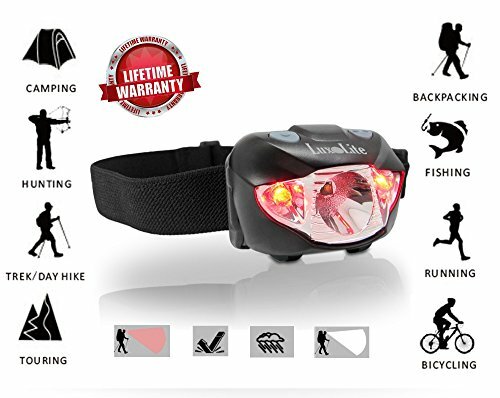 Perfect headlights for running, jogging, hiking, camping, hunting, biking, cycling, caving, mining, backpacking, fishing, walking your dog at night, reading, household work, under hood of car or on construction helmet hat! ? DURABLE WATERPROOF : IPX6 rated head lamp. Sturdy and compact outdoor gears for the best in stress-free reliability. Keep going for hours on the 3 AAA Duracell batteries included. Don't be left in the dark when light goes out during a storm or car breaks down along a dark road. Keep a back-up in the medical and emergency kit. ? LIFETIME GUARANTEE : So many have put their trust in the premium quality of our LED headlamps that we happily offer it with 100 % Satisfaction Lifetime Guarantee. You won't get this lifetime guarantee from the big brands like Petzl, Black Diamond, Energizer, Coast and many others. BUY WITH CONFIDENCE and CLICK the "ADD TO CART" button NOW. You will soon ask why you never got this lite before!